17% use Instagram most often, relatively flat from 18% last year. The results bring to mind research released late last year from Forrester. That study found that while Facebook wasn’t perceived to be as “cool” as Snapchat or Instagram among 12-17-year-old users, it was the most heavily used platform. In another study, from Piper Jaffray, Instagram remained as the “most important” social network to teens, with Snapchat rising quickly to top Facebook and rival Twitter. Meanwhile, it’s a very different story when taking into account the rest of the Infinite Dial survey sample (not just youth). Among all respondents aged 12 and older, Facebook easily leads in reach, currently used by 64% of respondents, up slightly from last year’s 62%. 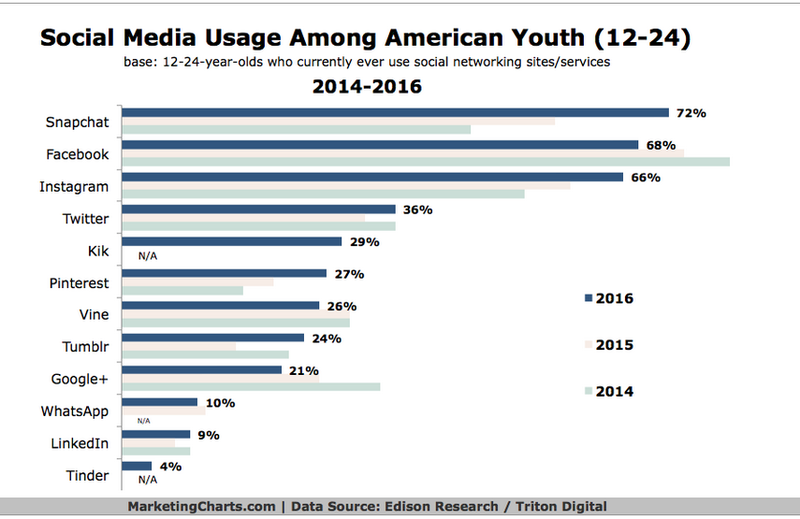 Instagram follows (29%, up from 24%), ahead of Pinterest (25%, up from 21%) and Snapchat (23%, up from 17%), with each of these apparently currently used by more Americans than Twitter (21%, up from 18%) and LinkedIn (20%, up from 18%). Facebook again leads in frequency of usage, also, with 35% of respondents saying they use it “several times per day.” Snapchat (12%) and Instagram (12%) are the next-most heavily used platforms among the entire 12+ sample, followed by Twitter (7%). Men (7%) are also more likely than women (2%) to tab Twitter as their most-used platform. Among 12-24-year-olds who feel it is very or somewhat important to keep up to date with music, YouTube (86%) is the most commonly used source for doing so, ahead of friends and family (74%) and AM/FM radio (58%). About the Data: The results are based on a national telephone survey conducted in January and February 2016 of 2,001 people aged 12 and older. Interviews were 52% land line and 48% cell phone, and the survey was offered in both English and Spanish.